Assembled dimensions are 65 long, 31 wide at handlebar, 37 high at the handlebar stem to the floor, the seat has some height adjustment. 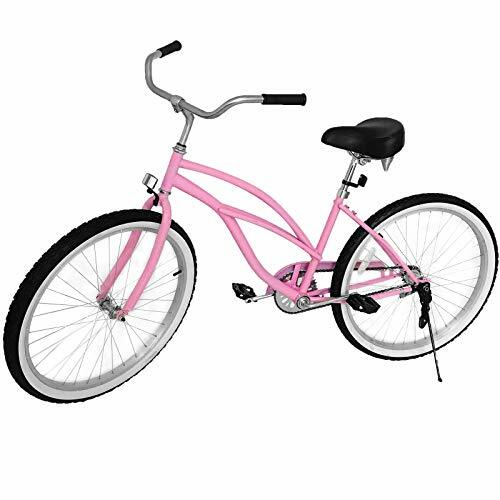 Single-speed is ideal for casual, recreational riding on flatter terrain. 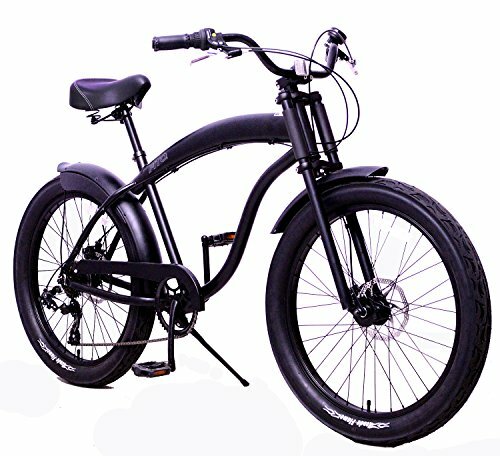 The rear coaster brake system is easy to use just pedal backwards to glide to a stop. Good for rides up to 20 miles and speeds up to 15 MPH. 3-speed Shimano internal hub with easy-to-use Nexus shifter gives you more gears for climbing hills and enjoying longer rides. 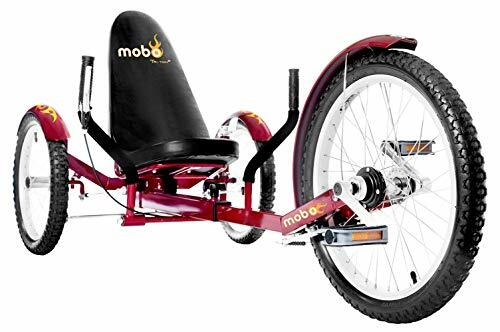 Good for rides up to 20 miles and speeds up to 15 MPH. 7-speed Shimano external hub allows for more riding options from short leisure trips to long distance commutes. Includes front and rear handbrakes. 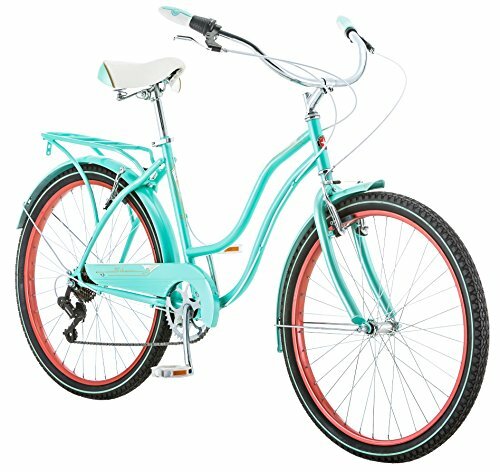 Includes rear coaster brake. Good for rides up to 30 miles and speeds up to 20 MPH. 21-speed Shimano Tourney derailleur provides a wide range of gears for tackling more high intensity riding. Front and rear handbrakes make stopping easy and precise. Good for rides up to 40 miles and speeds up to 30 MPH. FRAME SIZES: 18". EXTENDED FRAME, 2" LONGER THAN THE REGULAR FRAMES. FOR MEN BETWEEN 5'2"~6'0". CRANK FORWARD DESIGN. SHIMANO TOURNEY 7-SPEED DERAILLEUR. SHIMANO REVOSHIFT GRIP SHIFTER. SHIMANO TZ-21 FREEWHEEL. SHIMANO FRONT & REAR DISK BRAKES. PROMAX ALUMINUM ALLOY BRAKE LEVERS. KMC CHAIN. KENDA 24"x3.0" WIDE TIRES. TIRE DIAMETER: 26". FORGED ONE-PIECE CRANK ARM. ALUMINUM ALLOY 24" RIMS. ALUMINUM ALLOY 4-BOLT STEM. FRONT & REAR CUSTOMIZED FENDERS. VINYL LEATHER GRIPS. OVERSIZEDVINYL LEATHER SADDLE. 80% PRE-ASSEMBLED. 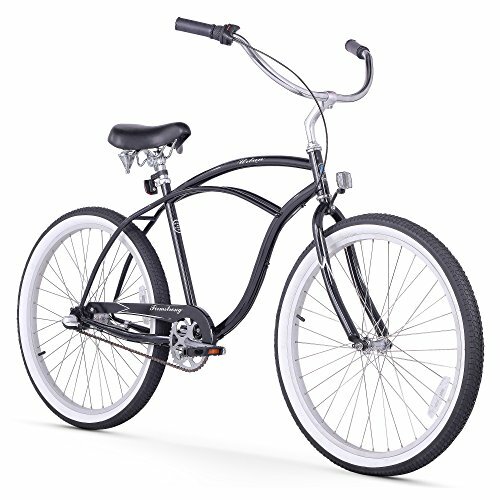 THE ADJUSTMENTS OF FORK, FENDER, WHEELS, GEARS, AND BRAKES ARE REQUIRED. PROFESSIONAL ASSEMBLY IS RECOMMENDED FOR THIS MODEL. LIGHT WEIGHT AND ANTI-RUST ALUMINUM ALLOY EXTENDED FRAME. ALLOY HANDLE BAR, STEM, AND RIMS. SHIMANO FRONT AND REAR DISC BRAKES. PROMAX ALLOY BRAKE LEVERS. KENDA 24X3 HIGH PROFILE WIDE TIRE. TIRE DIAMETER: 26. 80% PRE-ASSEMBLED. JUST NEED TO INSTALL THE FRONT FORK, FRONT WHEEL, HANDLE BAR, SEAT, AND PEDALS. 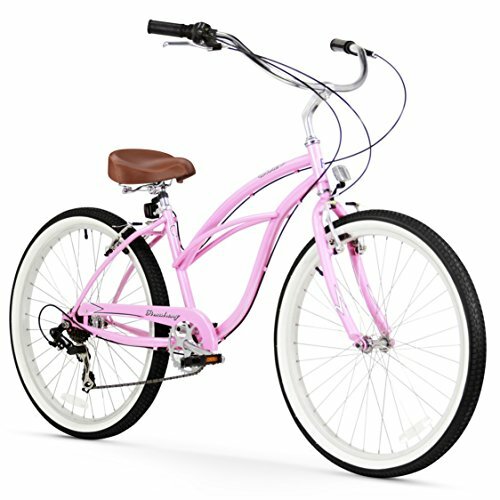 THE ADJUSTMENTS OF FORK, WHEEL, BRAKES, FENDERS, AND GEARS MAY BE REQUIRED. PROFESSIONAL ASSEMBLY SERVICE IS RECOMMENDED. 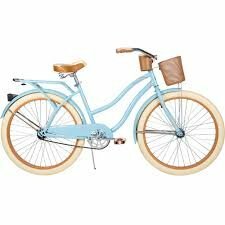 The Margaritaville 26" Cruiser Women's Cruiser Bike with Sturdy Handles & Alloy Frame is a stylish, single speed bicycle that is perfect for riders who are looking for a smooth ride. 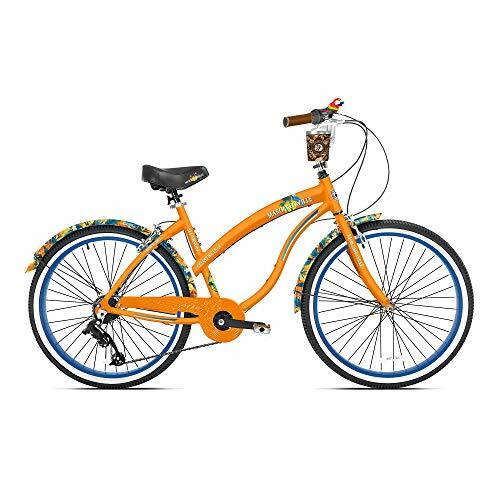 Whether you are looking for a bike for the boardwalk or to ride around town, the Margaritaville will get you where you need to go. 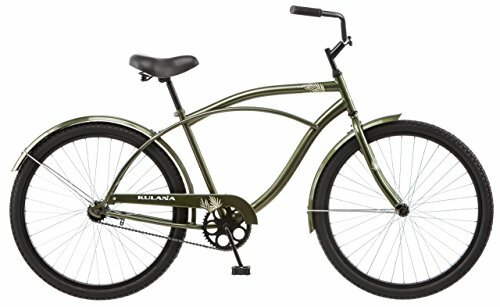 This sturdy custom design alloy frame is complete with alloy rims and vibrant full graphic fenders for a classic cruiser look.